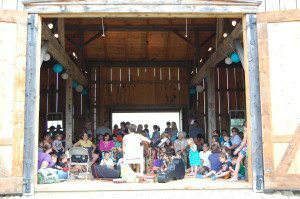 Our Kids' Concert Series - Sing-Along with Lori Burke, is held Wednesday mornings from 11 to 11:45 am during the month of July. Kids of all ages will enjoy Lori's Sing-Along. They'll learn a mix of childrens', folk and original music from Lori. Admission is $2 per person, ages 2-102; free for members of Goodell Gardens (with your membership card), and children under the age of 2. Please bring a blanket or chair to sit on, as our available seating is limited. Goodell Gardens receives state arts funding support through a grant from the Pennsylvania Council on the Arts, a state agency funded by the Commonwealth of Pennsylvania and the National Endowment for the Arts, a federal agency.